Raqqa post explains why there is no resistance in Raqqa to face Daesh and the SDF. The regime actions to destroy the revolution from within and the arrival of the extremist movements have enabled Daesh to single out in the Province. Raqqa post explains that when the defections started within the SAA during the revolution, the regime was prompt to act quickly in all Syria and especially in Raqqa to contain the military defections through creating suspicious factions run by special military operations. In Raqqa, one man was responsible for those milutary organisations and was known long before the pre-liberation of Raqqa : The Aid Officer Muhammad alAhmad known by Raqqa people as “Abu Jassem” and as Colonel “Samir” the chief of the miliary security recruitment center in Raqqa. So, Abu Jassem run and financed those formations which objectives consisted to spread chaos and present an ugly picture of the revolution, act as regime informers, robb and assault innocent people, abduct and demand ransom. All that to destroy the syrian revolution grassroot and push the people to ask those so called military brigades for protection. Those brigades have hosted all kind of people including thieves, homeless people, shabbiha and trained informers. They all worked under the revolutionary cloth and banner, exploiting the reality of the social vulnerbility. The arrival of fundamentalists such as Daesh, Nusra and Ahrar alSham who were as much hostile to the revolution as the regime forces, participated too against the revolution and Raqqa, and have hindered also the formation of a local resistance against Daesh gradual predation and singling out of power in the Province. After the formation within the #SDF/#QASAD, the PYD militias either created and armed some local forces or pressured some former armed groups, to employ them and create a false picture of a diverse and pluralistic unity that would seduce the US. However, the reality is otherwise and far from being ideal, because the PYD is the on only decision maker who draws the policies in the areas under its influence, and takes advantage of the fragility of the people of Raqqa who have lost both material s and even geographical resources to achieve their independence either from the PYD or its factional narrow-minded programme. Raqqa Post carried out during 2 months a detailed inquiry regarding the relationships of the factions, the circumstances of their birth, their funding, their numbers, and their political and intelligence connections. Number of members : no less than 50. They are mostly from Tal Abyad and northern province Some of them were sent to Manbij. Raqqa Post published recordings proving their role in recruiting for the regime and in receiving arms and ammunitions from alQamishli (see post). Funding and coordination support : They get support from the regime and Russia. They get coordination in the city of Hassakeh with the AF intelligence, and the Qamishly airport to receive both ammunitions and salaries. The remaining services are provided by the PYD. Commanders: the military commander is Fayyad alGhanem & the commander in charge of public affairs is Ayman alGhanem. Work assignment: to gather intelligence for the PYD militias around the city of Tal Abyad and its inhabitants, and the whole northern countryside. Date of birth: 13/09/2014 in the city of Ras al Ain in al Hassakeh Province. They were among the first to join the PYD alliance and to enter Tal Abyad in June 2015 after Daesh withdrawal, where he raised the revolution flag but the PYD militias lowered it and replaced it with the PYD flag. Number of members :2o to 30 fighters. Funding and coordination support : Liwa Tahrir get supports in arms, ammuntions and salairies from the PYD. from the regime and Russia. The get coordination in the city of Hassakeh with the AF intelligence, and the Qamishly airport to receive ammunitions and salaries. The remaining services are provided by the PYD. Commander: Mohammad Karim alAbid aka “Muhammad KafraZeita”. He was the former commander of al Faruq special task unit. He was in charge of the Public Relations for QASAD. Work assignment: Liwa Tahrir clashed with Liwa Thuwar Raqqa, and was forced to leave the city of Tal Abyad, and were given an area in he ghost city of Suluk and its villages. His forces participated to the “Testhrin Damm” battle. 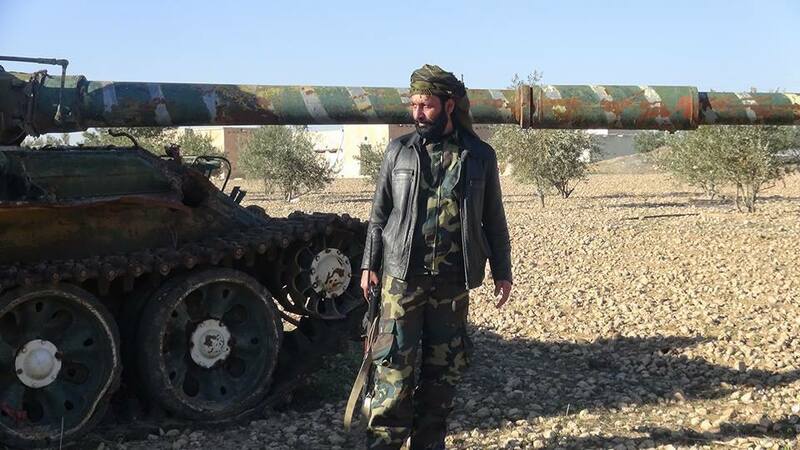 After the clashes in Hasaka between the regime and the PYD militias, the latter accused him to cooperate with the regime and to coordinate with alGhanem militias in addition with both “Abu Wael” and “alBuls” groups to seize the town of Tal Abyad in coordination with the regime, it dissolved and disarmed the Liwa, dismissed “KafrZeita from its job of Public Relation officers, allowed him to stay in the city where it began to dissolve the other squads one by one. During a brief period, KafrZeita left with no less than 8 fightes to the village of “Kanytra” and broadcasted a video calling the US to pressure the PYD that was marginalizing the arab factions. After the PYD learned where he was, it asked him to leave the abandoned village but was able to keep them busy until he reached Turkey with the fighters and their weapons. Birth: Liwa is based mostly in the north of Raqqa province and had a battle front in the vicinity of the Brigade 93. Formerly he was affiliated to the FSA under Jihad. When he was affiliated to the FSA, he was funded by the FSA General command and members of his families. Number of members : 25 members mostly from the northern rural population. Funding and coordination support : PYD since he has joined QASAD. Work assignment: It has more than one confrontation lines at the west of alHisawi. After the departure of the commander “KafrZeita”, a state of confusion happened within the PYD that carried out arrestsand investigations against Farhan al Askar “Abu Wael” forcing him to issue a statement written beforehand by the PYD on his personal FB page. He is now under forced residence and was disarmed. Birth: The commander is a former member of Liwa Thuwar Raqqa. He formed the Liwa Furat Shield. Number of members : no less than 25 who were killed in Manbij and against Daesh in the village of alHaysah. The liwa has no more members. Commander: Adallah Khattab alOmar aka “Abu Yusuf alWaldawi”. PYD is accusing him to collaborate with Liwa Tahrir. Birth: After the take over of Tal Abyad. But the founder have a story of the founder of a gang exortotion after the liberation of the city of Raqqa. Abu Khalaf was then, a bulldozer driver with no military experience. He founded a gang “Harun alRashid group” moslty known to extort the population in Basil street and “Thieves neighborhood”. 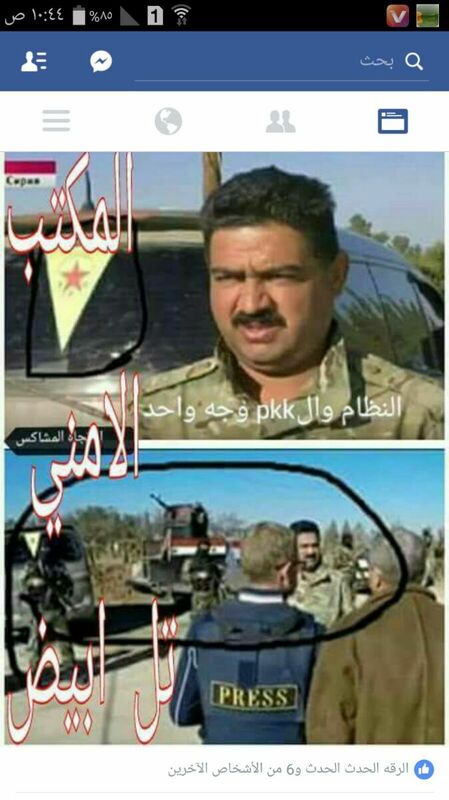 After the take over of the city of Tal Abyad by the PYD, he returned to his village, “alBageliyeh” where he gathered few memeber of his relatives, and joined the PYD. Funding and coordination support : PYD that provides salaries and light weapons. Commander: Abu Khalaf was a bulldozer driver. Birth: A small group set up by a corporal in the village of Ein Al-Nassar Arus. Number of members : no less than 15 moslty of the corporal’s families. Funding and coordination support : PYD for salaries and light armmament. Commander: Arif alNassar was arrested on charges to collaborate with the regime and and later was released. Relationships: accused to collaborate with he regime and Security intelligence. The group was dissolved. Birth: A small group formed of family members and some other members. The group was affiliated to the “Umana Raaqa” after the liberation of the city of Raqqa. After the Umana alRaqqa merged with Ahrar alSham, the group took over of the power headoffice. Later after the small battalions and groups were severed, the group joined Ahrar al Sham in exhange to keep the power headoffice. Then the group left to Turkey. After the liberation of Tal Abyad, the group was formed again and joined the Burkan alFurat operation room. The group was dissolved by the PYD in Ain alArus village and members arrested. 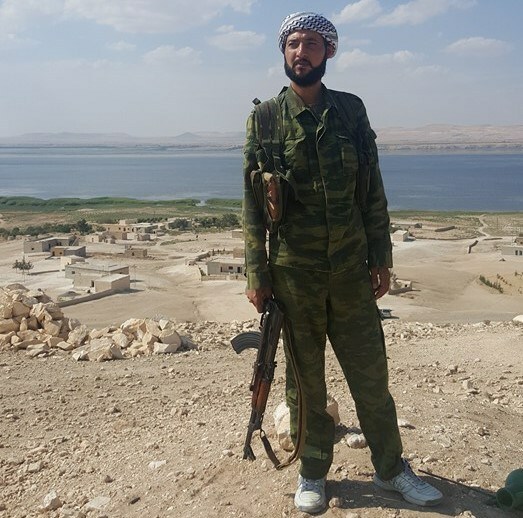 Commander: Qassem al Bulus left for Turkey after the PYD accused him to coordinate with the regime. Relationships: accused to collaborate with he regime and Security intelligence. There are other small groups with marginal and security tasks. The “Fayad Shibli” group is the most dangerous. The group is formed of 10 members. It collaborates with the regime and main task is to reconcile the former FSA members and some civilians with the AF intelligence. Members of his group left him after they discovered his real task. PYD arrested him than released him.